Today: To improve upon a classic sandwich, don't limit the cheese to the interior. It wasn’t until I was in college that I realized tomato soup can be made from actual tomatoes. For me, tomato soup always came from a can. I loved the way the gelatinous tomato blob would slither out into the pot and resist becoming chummy with the water I added. But what I really loved was the grilled cheese sandwich that always accompanied my soup, the greasy bread hugging that melted neon-orange cheese. I’d insist it be cut into triangles so I could pull at its pointed edges and see how far the cheese could stretch. The appreciation for grilled cheese and tomato soup apparently runs in the family, as my oldest son regularly requests it at our dinner table. Over the years, I’ve learned a few things about improving that classic meal of my childhood—like how to turn sweet summer tomatoes into a flavorful soup with little more than a blender and salt and how to make the very best grilled cheese sandwich. What makes this sandwich a modern classic is the cheese—what type and how it’s used. First let’s talk about what’s on the inside: Gruyère. It’s nutty, complex, and stunning when melted. Sharp cheddar does nicely, but I tend to stay away from the orange stuff for grilled cheese, as I find that it doesn’t pack nearly as much flavor. The next step is to mix some cheese into the butter that coats the exterior of the bread. Now this—this—is what turns this classic into a showpiece. Fine gratings of Parmesan blend with the soft butter so that when the sandwich hits the skillet the bread goes crisp, basically creating a cheesy cracker shell. 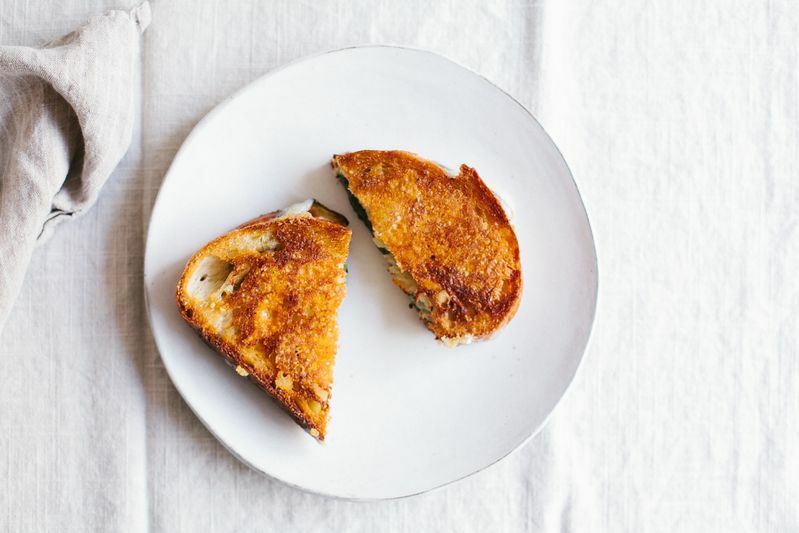 If you’ve ever tasted Parmesan Frico or scraped up the little bits of baked-on cheese from the pan, then I imagine your mouth is watering right now. More: And you'll also love Parmesan toast. 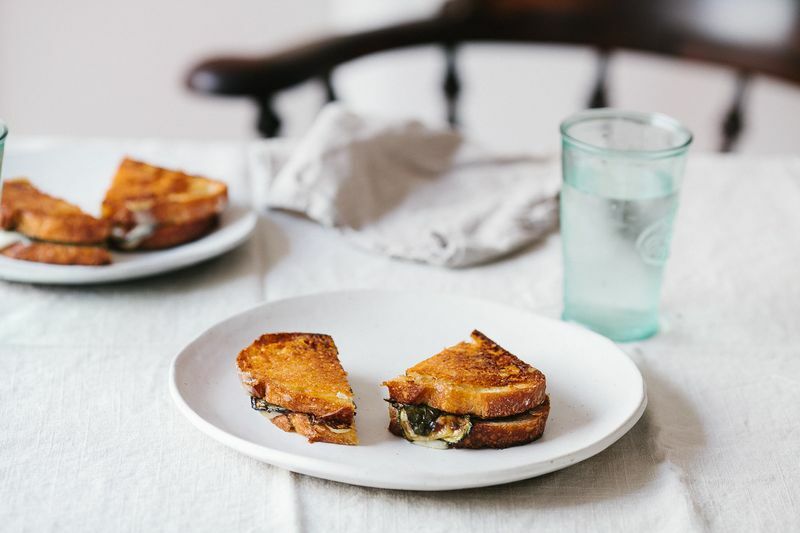 In addition to the cheese, I add freshness and complexity to this sandwich by layering on pan-fried zucchini and basil leaves, but they aren’t necessary. Seven-year-old Ashley would not have approved of these additions and if you agree with her, feel free to leave those out or add in something else, like fresh tomatoes or roasted peppers, in its place. If you do decide to add a few additional elements to your grilled cheese, be sure your cheese slices are hugging both pieces of the bread so that you get a cohesive sandwich. My last tip is to keep the heat on medium-low so that the interior cheese has a chance to melt before the bread doesn’t get too dark. So what have we learned here today? It’s all about the cheese. But I think we already knew that. These sandwiches are driving me crazy. Yummy. Grilled cheeses are cheese and bread. Anything else is a melt. The End. Similarly, we discovered several years ago, when my dear sister (D.C. Food52 faithful) sent me some shallot marmalade, that anything sweet-sour onion utterly transforms a grilled cheese sandwich. I now regularly make / keep onion jams of all kinds, including leftover caramelized onions into which I stir stoneground mustard + red wine or cider vinegar, for this purpose (among a few others). 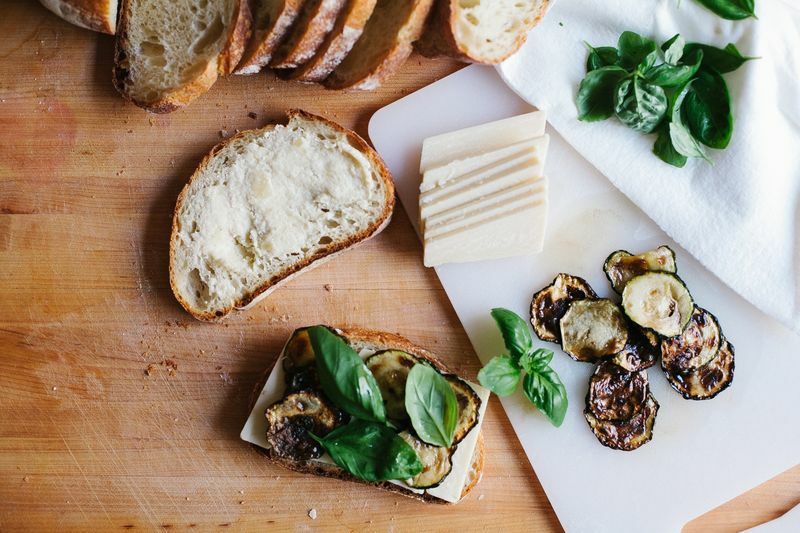 Love the idea of grilled veggies + fresh basil. We always seem to have thin slabs of grilled zucchini and eggplant, marinated in garlic / herbs, during the summer, so this will be a cinch to implement. Thank you! ;o) P.S. 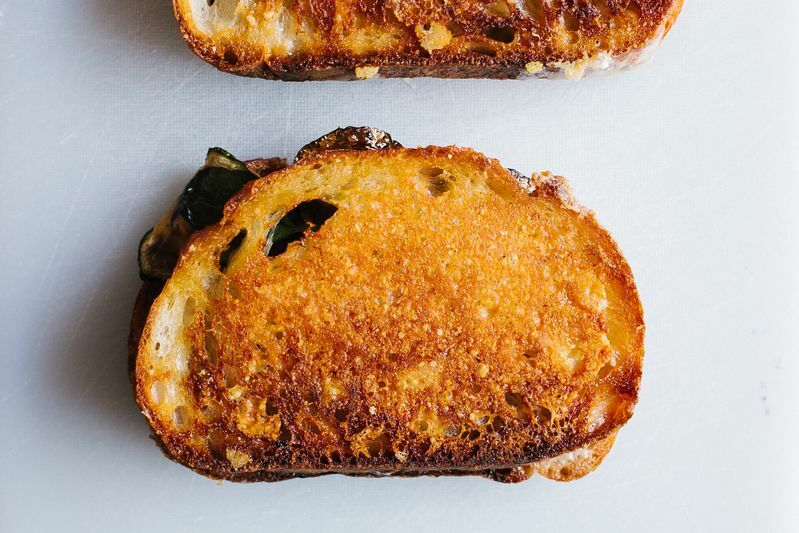 We're big fans of the panini press here for chewy-gooey crispy cheese sandwiches. All that heat coming every which way melts the cheese deeply into the bread. I realize you can't get the external crust, but you do get those divine crispy little brown ridges. Think, Mailliard everywhere. And, like our mac'n'cheese, our grilled cheese invariably involves more than one type of cheese, grated and tossed together to blend nicely.